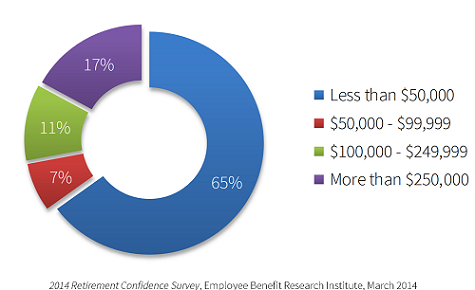 More than 50 million Americans participate in employer sponsored retirement plans. However, for most individuals retirement plan participation has not translated into retirement success. According to a 2014 report by the Employee Benefit Research Institute two-thirds of retirees have less than $50,000 in total savings and investments.With so little stashed away for retirement, the vast majority of retirees are living almost entirely off of their Social Security income. So why is there such a disparity between what investors have saved and what they’ll need in retirement? Some in the industry blame poor investment choices and performance; others blame confusing disclosures and excessive fees which can sometimes reach well over 4% annually. These factors most certainly contribute to poor returns, but they are only a symptom of the underlying problem. In the past few years, the DOL has increasingly been concerned with the results associated with retirement plans, and have identified specific actions fiduciaries should (and sometimes must) take in order to increase the success of participant outcomes. A significant factor in the development of these changes was increasing awareness of an embarrassing reality. As it turns out, most financial advisors are not legally responsible parties (i.e. “fiduciaries”) to the retirement plans they manage, and therefore do not provide investment advice. This, despite receiving “investment advisory” fees. In other words, most investment advisors do not provide investment advice on retirement plans. Rather, they provide access and – if the participants are lucky – a little education. While several factors likely contribute to the poor results retirees are experiencing, one thing appears to be crystal clear: the ability for participants to retire comfortably requires more than access to a retirement plan. In response to these systemic flaws in retirement plan industry, in 2014 the Department of Labor (DOL) began encouraging sponsors to outsource their fiduciary management. The DOL’s latest regulatory changes (April, 2016), will likely intensify this trend as it dramatically expanded the definition of fiduciary advice to include nearly all investment-related management decisions. As a result, most information delivered to plan participants about how to invest will now be held to the fiduciary standard. Concerned that their plan could be a liability, and recognizing the benefits of outsourcing, plan sponsors are engaging fiduciary managers more than ever. Independent & impartial advice: Our firm has no financial relationships with any other service providers. Instead, we work directly with and for you to maintain a healthy and successful retirement plan. Acceptance of 3(38) fiduciary management role: As a 3(38) Fiduciary, we share responsibility for your plan’s legal compliance by screening, selecting, and monitoring plan investments. We also assist in maintaining an appropriate investment policy statement. Effective participant education: Through in-person meetings, personal phone calls, newsletters and blog posts focused on market analysis and practical planning tips, we utilize various forms of communication to educate participants and improve outcomes. Ability to negotiate institutional pricing: As a fiduciary, our firm has both the capabilities and obligation to ensure you receive competitive pricing. Through our competitive analysis, we simplify the actual cost of the retirement plan and then negotiate with plan providers to ensure you receive the best possible price. Target Date Portfolios & “do it myself” options: One of the challenges participants currently face is a lack of investment knowledge, often leading to bad investment decisions and poor performance. We overcome that challenge by providing actively managed portfolios designed to achieve specific objectives. For participants who wish to make their own decisions, we also provide a broad array of low-cost index and actively managed investment options. As retirement plans and the regulations that govern them grow increasingly complicated, meeting your fiduciary responsibilities and helping your employees accomplish their objectives will become more challenging. Plan Financial can help you understand and fulfill your duties as a plan fiduciary while helping your employees accomplish their objectives. Whether you are interested in a complementary analysis of your current plan or looking to begin a new plan, we welcome you to discover the Plan Financial difference.